Material: Made of environmentally friendly PP(Polypropylene), brighter and smoother surface, good toughness, hard to break, high/low temperature resistance, long service life, be used repeatedly. One-step molding technology, more durable, which won't have the conditions of distortion, product quality is guaranteed. Extra-large cap, increase contact area, conical nail head, easier to insert into the ground. Agnail designed to ensure the firm fixation of the nail to the earth, hard to be pulled out. No leaching into the soil, safe for vegetable garden use. For fixing the gardening plastic mulch into the ground, Also for fixing fly nets, shading net, tents, game nets and rain tarps. Works great for landscaping, gardening, camping and other support needs. Perfect for use in the yard, dog fences, landscaping, turf, electric fences and many more. 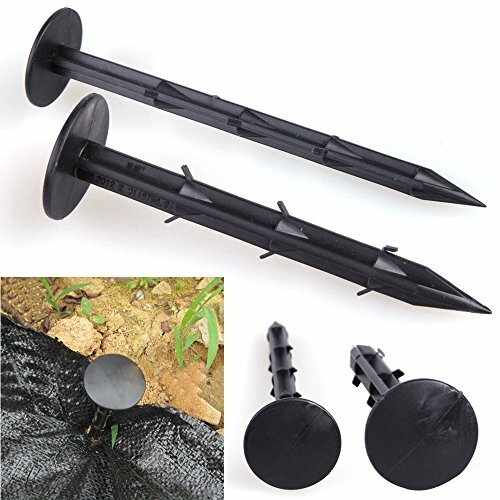 Type: 8"/20cm Gardening Ground Nail, For fixing the gardening plastic mulch into the ground, Also for fixing fly nets, shading net, tents, game nets and rain tarps. High Quality: Made of environmentally friendly PP(Polypropylene) material, brighter and smoother surface, more resilient, hard to break, high/low temperature resistance, long service life, be used repeatedly. Extra-large cap, increase contact area, conical nail head, easier to insert into the ground. Agnail designed to ensure the firm fixation of the nail to the earth, hard to be pulled out. Application: Works great for landscaping, gardening, camping and other support needs. Perfect for use in the yard, dog fences, landscaping, turf, electric fences and many more.